Hey guys! I’m going to be in my college’s student orientation from 10am to 10pm when you’re reading this, so I decided to do something a little bit different. I wrote a review for Nintendo Labo about two months ago now for KeenGamer, but I got one review copy in after another (which takes precedence over a game I bought with my own money), and even though my Labo review was practically finished, we just never released it. Think of it a bit like Star Fox 2. So instead of publishing it there for five people to read it, I might as well publish it on here! I didn’t make any promises to publish it on that website, so it shouldn’t be a problem. Enjoy! Back before Nintendo got into the business of making video games, but after they made hanafuda cards, they were a toy company. With devices such as the Love Tester and Ultra Hand, Nintendo were already toying with the idea of making devices for kids to have fun with before the NES ever hit store shelves. And while the company has consistently continued to deliver experiences more playful and experimental than their competitors, with mixed results, it has since become almost exclusively a video game company. It comes as a surprise then that Nintendo would themselves publish and release something in the year 2018 that resembles a line of toys more than it does a video game. Nintendo Labo seems to be, as many observers have wryly noted, $70 to $80 cardboard, but that judgement immediately falls flat on its face the second you open up the stylish box. Inside, there are, of course, sheets upon sheets of cardboard, along with a few other things such as string and reflective tape. But, before you can see any of that, you see a case containing a Switch cartridge is in its own cute little cardboard container. Nintendo Labo is still very much a set of toys before it is games, but it is a set of toys that nonetheless utilizes both Nintendo’s hardware, through the Joy-Con’s unique technical abilities, and software, through the content found within this cartridge. Nintendo Labo is a wild product that doesn’t fall neatly into any one category. It is a construction kit. It is a collection of mini-games. And it can be programmed by anyone to be pretty much anything, from a guitar to a bank. Regardless of what this thing is, it is, safe to say, not just a bunch of $70 cardboard. 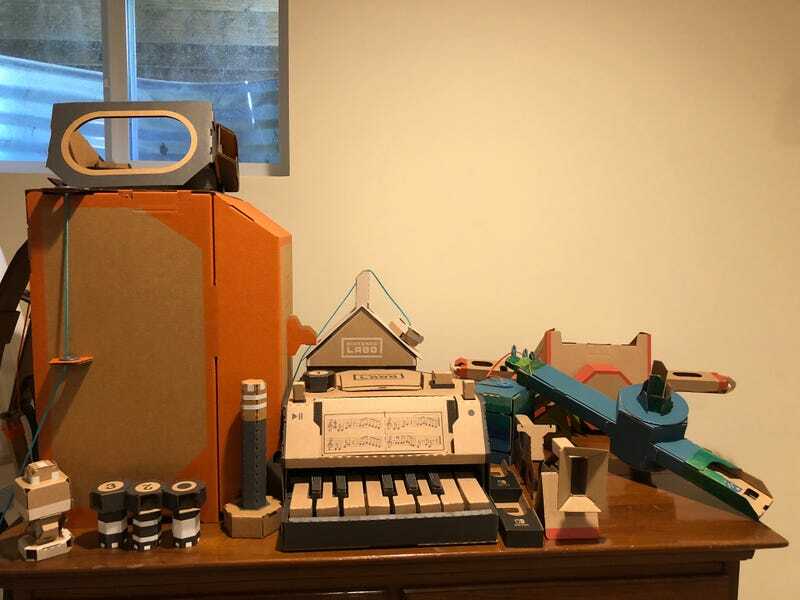 The Variety Kit offers five unique cardboard creations with their respective software. Some act more like games, others act more like interactive software, but they all offer an experience as deep as you are willing to take it. Those with an imaginative mindset will find great value in experimenting with the wealth of ways to create their own experiences, but those lacking this creative spark very well might find themselves with a bunch of cardboard they have no idea what to do with. The Robot Kit, on the other hand, is one large cardboard creation that is easily the most complex and rewarding thing to build, but provides an inadequately superficial gameplay experience to reconcile the price tag on its own. The Nintendo Labo Variety Kit and Robot Kit can be purchased separately, with the Robot Kit costing more than the Variety Kit. Due to the physical nature of these products, they can only be purchased in retail stores or through the mail. There is also a Nintendo Labo Customization Set which includes two themed stencil sheets, sticker sheets, and tape rolls to decorate your Labo creations (not tested for review). Both kits are exclusive to Nintendo Switch. In one sense, Nintendo Labo is not a “finished” product. Unlike a game such as Super Mario Maker, these five toys (or “Toy-Con,” as Nintendo put it) has a core, thought-out design. But the construction of these Toy-Con is dependent on the consumer. While this is unmistakably a long and often complex process, it is also one that will likely appeal the most to older audiences, and one that provides some of the most intuitive instructions seen in any construction kit. Aside from the somewhat cheeky cardboard instructions telling you how to put the cartridge into the Switch, no other physical instructions are to be found here. Instead, Nintendo opted to relay instructions via an interactive video. Not only does this video perfectly display every fold, piece of tape placed, and string strung, but it does so while allowing full use of the camera’s angle and proximity. Likewise, going back to reexamine something or skipping past an identical portion takes a single tap of a button or the screen, with different options for speed. In these types of cardboard constructions, unclear instructions often frustrated me and my dad while we built figures of Saint Basil’s Cathedral or the Eiffel Tower. Nintendo Labo, on the other hand, provides one of the most intuitive and comprehensive ways to instruct someone on how to fold together pieces of cardboard. For those not initiated with cardboard construction, be aware that it is a somewhat meditative experience. While some, myself included, derive joy from the simple and somewhat repetitive act of slowly seeing a creation come to life, others might quickly become bored. There’s no harm in putting on a podcast or music in this case, but this might distract from the game’s own witty commentary and funky beats. The aforementioned video is accompanied by overlayed text, explaining the aspects of construction that are harder to convey in a video. The text is written with a whimsical and slightly childish flavor not far removed from the style of Animal Crossing. Different pieces are given different nicknames, short anecdotes are told to personalize the pieces, and each action (i.e. folding, wrapping a string, sticking on a sticker) is given its own written sound effect. While the ideal audience for this type of humor falls more on the younger side, the playful language keeps the instructions from being dry in a tasteful manner. Never before have I had to consider the music in a discussion on building cardboard, but here we are. On its own, it provides a groovy tune with lots of odd, yet thematically appropriate instrumentation, almost as if the music itself was a home craft. This is not to say that it is poorly composed, but it does take an even more playful tone than most music in Nintendo games, which can get quite grating when calmly folding cardboard for hours on end. Fortunately, you can easily turn the music off, but this has to be manually done every time you start up the game. Before going into the actual Toy-Con, it should be noted that Labo throws in a few other pieces of cardboard to toy with. None of them take over 20 minutes to build, and many of them can be put together in a matter of seconds. These extra snippets vary from interacting with the actual Toy-Con in a new way to being used to make original creations, to just being a little box to hold tiny bits of cardboard. While the same core method of construction is used throughout, there are a few differences. The RC cars only take about 10 minutes each to put together, while most of the other creations take anywhere between two to four hours, with the robot taking the longest to build. They all start with popping out the cardboard pieces from their sheets. After that, the beginning of any Toy-Con construction consists of lots and lots of folding. However much cardboard you think you’re going to be folding, double that amount. Folding is very important to making everything cleanly come together, but it can often be a very mundane experience. While every fold is pre-creased and is very hard to mess up, it still requires significant pressure, potentially feeling like a battle against particularly long creases you have to fold. Nevertheless, once you have finally folded your cardboard, it’s time for the fun part: building. Not unlike the satisfactory click of sliding a Joy-Con into place on the Switch, there’s a tactile satisfaction that comes with snapping a tab into place and seeing your creation take form. While other products often show a divide between the pristine look of the end product on the box and what you actually end up building, these Labo creations look exactly as advertised if you follow all of the steps. Not only that, but the way cranks, knobs, and keys (both house keys and piano keys!) work feel effortlessly intuitive in action. In some instances, a piece of cardboard is inserted into a slot so that when you turn a crank, it makes a satisfying “click” sound as you turn it. And that’s really the one word to sum up the act of building the Toy-Con: satisfaction. Everything from the satisfying popping of the cardboard out of their sheets to the appearance of the final product feels, sounds, and looks good (smell and taste are neutral, although I haven’t tasted the cardboard myself. GameXplain has, though!). This is where older audiences will find the most value, especially if they’re not driven to create stuff of their own. Nintendo Labo, as a game, is rarely engaging. Some Toy-Con are more of a one-trick pony than others, but the “toy” part very much applies. Some of these range from fun mini-games to not games at all, but they all resemble much more of a toy for young audiences than a traditional video game, and need to be taken within that context. In the category of most game-like Toy-Con, we have the fishing rod and motorbike. You place the Switch itself vertically in its own cardboard dock, called an “ocean,” with a string coming out of it. The string is part of the fishing line connected to said rod, and thanks to the gyrometer from the two Joy-Con securely attached to the Toy-Con, moving the rod from side to side, pulling up or lowering down, and of course turning the crank corresponds to the appropriate action in-game. I had my nine-year-old sister try out each Toy-Con, and this is the one she enjoyed the most, likely sinking around five hours into it. It’s a simple game of baiting fish at different water levels, pulling up when they bite, and easing the line when they resist too much, but while it is simple, it isn’t easy. The deeper you go, the more unforgiving the timing becomes, but the concept was simple enough for my sister to get the hang of it in a matter of minutes. The motorbike is perhaps even more simple, and provides even less depth. There’s a simple track you can race on against unchallenging AI, and a mode where you can awkwardly attempt to pop balloons within a time limit. Neither are creative or well implemented, and it’s actually quite surprising to see a Nintendo game this devoid of charm. While it’s as fun to build as any Toy-Con, the actual way it’s used is easily the most uncreative, as you just turn the bike to steer. My sister played with it for a few minutes and immediately wanted to do something else. The Toy-Con house is similar to something such as Tomodachi, although much less complex. There are a few different contraptions you can insert into the house, including a crank, key, button, and even a portal. When you insert two of them in, a mini-game of some sort will pop up that involves a creepy little creature. Most of them take about 30 seconds to beat, with very little replay value. My sister got a bit more out of it than me, however, enjoying collecting the different beans as rewards for the mini-games and giving it to the creature to change its color. Nonetheless, she got tired of it after half an hour, and hasn’t asked to play it again since. Out of all of the Toy-Con, the RC car is easily the most like an actual toy. There are two included, (although you need a second set of Joy-Con in order to have them move at the same time) moving through the Joy-Con’s vibrations. Do you like RC cars? Then you’ll probably like this. The piano is the most complex of the Variety Kit, and while it isn’t really a game at all, it shows the most promise for experimentation. While there are only 13 keys, it’s possible to ascend or descend between six octaves by flipping a lever up or down, although it still causes a break in the music as you reach for it. You can use the different knobs to change volume (a bit useless considering how you can change the system’s volume), timbre, echo, and even make the Joy-Con vibrate to create a certain pitch, which changes if you place it on a box! My sister, who has been playing piano for a few years now, thought it was cool but got frustrated that she couldn’t play her pieces on there without having to constantly change the octave and ruin the tempo. Even if it’s a technical marvel and you can have old men sing at different pitches, it doesn’t beat an actual piano by a long shot, or even an electronic keyboard one with more octaves. You would think that the robot would offer much more in terms of gameplay, considering how it’s the only Toy-Con included in its kit. You would be wrong. You smash stuff. Not unlike Xbox Kinect, you punch your arms to have the robot punch, and step to have the robot step.The robot was an absolute joy to build, but there simply isn’t any substance to the game itself. There are other modes, such as a multiplayer if you happen to have another robot kit, a music mode where you can punch and stomp to make different sounds, and a customization mode where you can change the in-game robot’s color, but this is not a game that is for all ages. It’s a fun game for children to enjoy, although it only entertained my sister for half an hour, but there isn’t enough depth in really any of these games for most older audiences to remain engaged. The tech behind each of these contraptions is truly amazing, and it’s even cooler how Labo actually lets you dig into how each of these things work. In the “discover” section, for example, you can take a look through the IR camera in the right Joy-Con to see how it detects the reflective tape inside the piano! Additionally, there are “lessons” you can take to learn more about different aspects of each Toy-Con. There are three cartoon characters that “text” you, explaining how everything works, how to use different accessories with the Toy-Con (using some of the cardboard pieces you never used in the original construction), and even suggesting new ways to play with them. While the writing is especially tailored for young children here, it is nonetheless intriguing to see how everything works and play around with what you can do with the Toy-Con. The real place for potential here, however, is the Toy-Con Garage. Here, you can essentially program your Toy-Con to do whatever you want. This is done by providing an extensive list of both inputs and outputs, such as inputting a press of a button to have a Joy-Con vibrate. With this simple set of tools, people online have been able to create some amazing things, from music videos to making a Zelda jingle when you turn a key. Your imagination is the only true limit here, but personally, that’s quite the limit. If you don’t have the desire or the creativity to make your own music or Toy-Con here, that’s a lot of lost value. It feels weird to even have to italicize Nintendo Labo. You think of italicized titles as movies, literature, and video games that have a story to tell, a point to convey, or an experience to be shared. Under KeenGamer’s usual criteria for reviews, “story,” “gameplay,” and “graphics and audio,” Labo fails the first two and passes the last with mediocrity. But Labo is so different that these criteria didn’t seem to fit. Instead, we agreed to review Labo on its own terms, using the three selling points that Labo has displayed prominently on each box: “make,” “play,” and “discover,” the first passing with flying colors, the second still largely failing, and the last depending on the user. But there’s still one last thing to consider. The Toy-Con are not just toys, but models. If made right, most of them look very aesthetically pleasing as is, and can look even better if customized by someone with artistic talent. Very few people would tell you that they buy amiibo because of their actual value in gameplay, but people still collect them because they look cool. (I can personally attest to that, owning every Super Smash Bros. and Legend of Zelda amiibo!) Thus, when purchasing Nintendo Labo, you’re not just purchasing an experience, as you are with most other video games. You’re purchasing an item as well. Nevertheless, none of the above will change the fact that, yes, you are paying for $70 to $80 cardboard. Nintendo themselves stated before the announcement of Labo that it was intended for “kids and kids at heart.” If you don’t fit this description, Nintendo Labo probably isn’t for you. If you do, however, Labo more than makes up for its price tag by providing an experience so wholly unique that it feels wrong to italicize it.